Another reason why the puffer is remembered with special affection undoubtedly stems from the fertile imagination of one man, Neil Munro, creator of the “Para Handy” tales. The name of Munro, who lived in a burgh seafront mansion from 1918 until his death in 1930, has become so closely intertwined with that of his famous fictitious creation that it is hard to think of the one and not the other. It is believed that Munro wished to be remembered rather for his more serious works, and indeed historical novels like “John Splendid” and “The New Road” are of the highest literary quality. After all, he wrote the Para Handy, and other humorous short stories, originally intended as a form of light relief in the pages of the Glasgow Evening News, under the pseudonym of Hugh Foulis, as if he wished to distance himself from what he considered his more serious side. Yet so brilliantly did he capture the essence of the West of Scotland brand of humour in his stories about Para Handy and his vessel, the puffer “Vital Spark”, that they took on a momentum of their own, finding expression not only in book form, but inspiring the classic Ealing Studios film “The Maggie”, and four series of programmes on BBC TV. Local historian Alistair McIntyre, who is a director of Helensburgh Heritage Trust, has researched the history of puffers, and I am grateful to him for the details which follow. The puffer came into being through two influences — the barges on the Forth and Clyde Canal, and coastal sailing vessels known as gabbarts. Opened in 1790, the Canal soon proved its worth in making it feasible to move large quantities of heavy goods such as coal and stone from one part of the country to another. It also had links to other man-made waterways such as the Monklands Canal. Horses provided the pulling power. With the Industrial Revolution in full swing, some ambitious minds began to wonder if steam-powered engines could supplement, or even replace, horses, and from 1801-1803, a prototype vessel, the Charlotte Dundas — there were two versions involved — was tried out on the canal. Although judged a technical success, there were concerns about costs and the erosive effects on the canal banks by the wash from the paddle wheels, and so the experiments were terminated. Among those who inspected the rejected Charlotte Dundas was a certain Henry Bell, first Provost of Helensburgh and steamship pioneer. It was not until 1856 that the idea of engine power was once again brought forward. A Forth and Clyde Canal barge was fitted with a primitive single-cylinder steam engine linked to a propeller. The engine used a lot of coal, and it needed a great deal of fresh water. There was no condenser, and steam was vented into the exhaust. This produced a periodic “puff” of steam, and so the name “puffer” was swiftly coined. The idea caught on, and within a few years, the canal had 20 such vessels in use. The prototype engine was replaced in the 1870s by the much more efficient compound engine. This needed considerably less coal and water than its predecessor, and soon came to dominate. The new engine no longer “puffed”, yet the name stuck, and continued in use until over a century later. With some modifications, the horizons of the puffer were soon able to extend beyond the Forth and Clyde Canal, reaching out to the River Clyde and beyond. However, even for those vessels venturing beyond the canal, their length continued to conform to the maximum that could pass through canal locks — around 66 feet for the Forth and Clyde, and 88 feet for the Crinan Canal. The puffer would soon become a familiar sight off Helensburgh and the rest of the Clyde coast. Its other forerunner was the gabbart, essentially a sail-powered coaster, ideally suited to transporting substantial amounts of cargo from place to place. The secret weapon of both the gabbart and the puffer was their classification as lighter vessels. Such craft had relatively flat bottoms, which allowed them to beach almost upright where no suitable pier was available. All the crew had to do was to anchor on high tide, and simply wait for the water to recede, when horse and cart could come alongside and load up. Even where there was a pier, beaching might be preferred, as with manual loading and unloading it might actually be easier and there would be no pier dues to pay! Before the era of modern roads and engine-powered vessels, the gabbart proved indispensable for certain tasks. A good example is the building of Rosneath House, in the wake of the loss of Rosneath Castle by fire in 1802. The stone used was high quality freestone from Garscube quarry in Glasgow, and very large quantities were needed. The only feasible means of transport was by gabbart. Likewise, the 50,000 Easdale slates and 160,000 bricks would have been brought in by such craft. Another example is the palatial West Shandon, later Shandon Hydro, where white Bishopbriggs sandstone of the highest quality was brought in through the Forth and Clyde Canal. A photograph dating from 1878 shows two gabbarts on the foreshore at Garelochhead. At least one of them was owned by Finlay McNab, who had a grocery and coal yard in the village, not far from the beached vessels. Coal was typical of the type of cargo carried. The gabbart managed to cling on for many more years after the introduction of the puffer — puffers themselves also carried a sail for some years — but the advantages of engine over sail eventually carried the day. The down side of all lighter-type vessels was that they were inclined to pitch and yaw in heavy seas, so an essential crew requisite was an iron stomach! Those working on the puffers needed qualities far beyond the happy-go-lucky antics of the crew portrayed in the “Vital Spark” stories. Puffer men needed to be really tough, mentally and physically. They had to be first-class seamen, and ready to adapt to any situation that might arise. About the only area where fact and fiction would seem to agree is that many of the men who served were undoubtedly real characters. Dan McDonald, author of “The Clyde Puffer” (1976), made a two-week voyage on the puffer “Glencloy” (left) in 1954, and his account of the journey brings out those points, and more. This account is especially interesting in view of the eventual fate of the Glencloy on local shores in 1967. Built in 1930 by Scott’s of Bowling, she was the second vessel of that name, the first having been constructed on a beach in Arran, near Glen Cloy. By 1967, she had recently come under the ownership of Alexander McNeil of Greenock, and she was the last of the pre-war steam puffers still in general use. She had also undergone a change of name to the “Glenholm” shortly beforehand, being now the “Glenholm”. 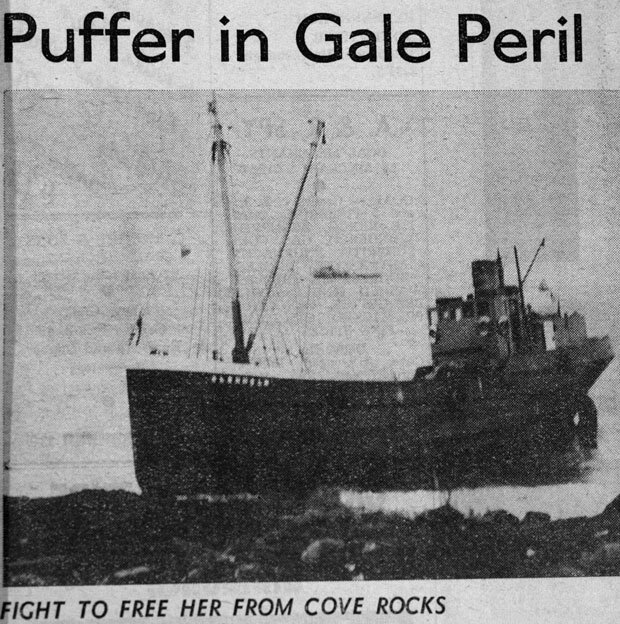 On a fateful day in November 1967, she was proceeding up river when she encountered a force 8 gale. She was blown on to rocks opposite Cove Burgh Hall, and the Helensburgh Advertiser reported that she had been slightly damaged, the hope being that she could be refloated on a suitable high tide. To that end, the crew, including skipper Neil McNab, a Lochfyneside man, stayed aboard for a couple of nights. This action presumably also meant that she was not yet open to salvage. The newspaper commented that there had been no mechanical failure, although another account claimed there had been a boiler problem. Whatever the case, the vessel sadly could not be saved, and was scrapped. Another even more dramatic event involving a puffer in local waters took place off Cardross on April 19 1951. The vessel, the “Petrel”, was also owned by Alexander McNeil of Greenock. Built at Larne in 1897, the “Petrel”, which had seen service at Scapa Flow in the First World War, had been engaged in dredging sand off Cardross. The skipper was the 23 year-old son of the owner, also Alexander, who had two crew members to assist him. A mechanical problem seems to have arisen, and it must have given cause for real concern, because Alexander’s crewmates had already taken to the puffer’s dinghy when there was a huge explosion in the engine room. Alexander, who had remained aboard, was hurled 15 metres through the air, landing not far from the dinghy. Fortunately he was uninjured, and all three then set course in the dinghy for Port Glasgow, but were picked up by a passing ship before they made landfall. The “Petrel” was subsequently scrapped. Dredging of sand off Cardross was a time-honoured pursuit, and often puffers were the vessels used. The prime aim was to help keep the shipping lanes navigable. Rather than dump the dredged material in deep water, it made good business sense to find a use for it. The problem was that the building industry had little use for sea-sand. However, some ingenious applications were to be found. Older readers may recall the stuttering of steam trains when leaving stations in frosty weather. One solution was to sprinkle sand on the rails to help provide purchase – and sea sand was ideal. Dan McDonald’s book refers to puffers owned by Paisley-based Warnock Brothers as “dredging millions of tons of sand in the Clyde estuary to bed Glasgow’s paving stones”. Records show that in the early decades of the 20th century, the company had puffers like “Argo”, “Brightlight”, “Dane”, “Douglas”, “Lucullite”, and “Tom Telford”, all hard at work dredging sand off Cardross. The use of paving stones on roads, and the need for bedding sand, came to an end in the 1920s, when tarmac surfacing of roads came into general use. The humble puffer also had a role in wartime. During the First World War, many of the hardy little craft had been used at places like Scapa Flow as fleet tenders. With the onset of the Second World War, this use was not forgotten, and the Government ordered a number of specially commissioned vessels. Known as Victualling Inshore Craft, or VICs for short, the first batch to be built were almost exact replicas of two puffers built by Scott’s of Bowling shortly before the outbreak of war, the “Anzac” and the “Lascar”. At 66 feet in length, they were faithful to the size limits imposed by the Forth and Clyde Canal. Later, another batch was ordered, this time being over 80 feet in length. In all, some 100 VICs were built in the period 1941-46. Another seeming gesture to tradition is that many were designed to burn coal rather than oil, which might have seemed behind the times. However, official thinking was that in the event of oil supplies from overseas being disrupted, coal was a safer bet, thanks to the plentiful home supply. Only two of the VICs were actually built in Scotland, far less the Clyde. Many were built by Dunston’s of Thorne and Pimblott’s of Northwich, with smaller numbers supplied by other English yards. But why should a vessel so much associated with the Clyde not be built locally? There was a good reason — Scottish yards were otherwise fully engaged in other war-related work. Some of the VICs did carry out wartime duties in Scotland, and of course existing puffers were among the small vessels that served on the Clyde and elsewhere during the war. Some VICs also served abroad, being transported on heavy lift ships for service as water and store carriers. Post-war, quite a few VICs were purchased by Clydeside companies. The attraction was that they could be had for around £4,000, as opposed to about £6,000 for a new build. Another source gives the asking price as £2,000. However, there was a catch, in that coal-burning steam vessels were by now uncompetitive, while running costs were rising relentlessly. Other factors that played against the traditional puffer included the rise of roads and road transport, and in due course, the introduction of roll-on roll-off ferries. Diesel engines and larger and better-equipped vessels came along in response, but the writing was on the wall for small coastal trading vessels. Len Patterson, a director of the Glenlight Shipping Ltd., the last of the puffer companies, and author of the fine book “The Light in the Glens”, comments on the financial and political considerations surrounding the final days of the company in 1993. He referred to the lack of a level playing field and the inevitable outcome — a very large increase in the numbers of big lorries on the roads network, carrying loads that could otherwise have gone by sea. What is the status of the puffer in Scotland today? The few examples that survive are actually ex-wartime VICs, and of these, only one, VIC 18, renamed “Spartan” post-war, was built in Scotland, a product of Hay’s, Kirkintilloch, in 1942. 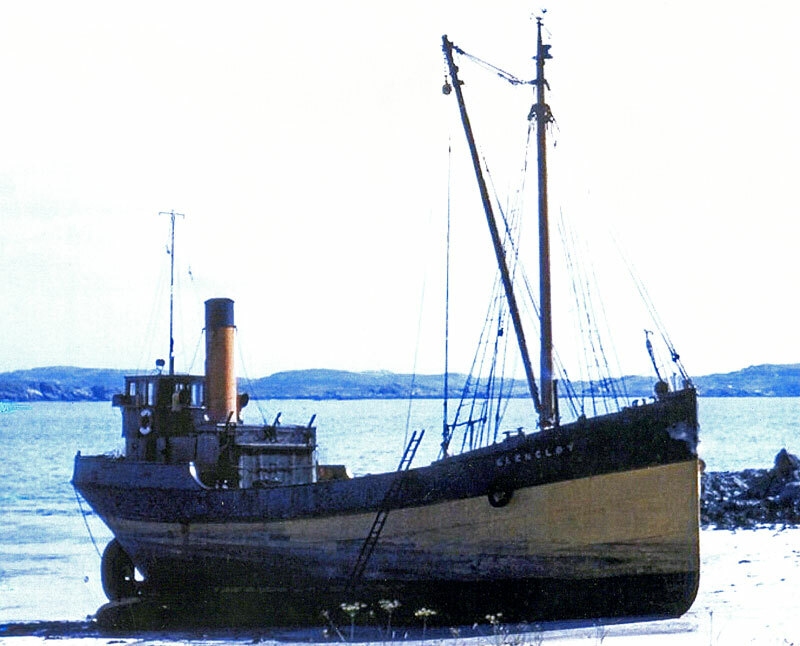 She was the first vessel to be acquired by the Scottish Maritime Museum at Irvine after it was set up in 1983. Much altered, she had her original steam engine replaced by diesel in 1961. Other survivors include “Auld Reekie”, ex-VIC 27, being restored at Crinan Boatyard; VIC 32, which has retained the name, does cruises, and is sometimes seen in local waters; and “Vital Spark of Glasgow”, ex-VIC 72, which has had a very varied history and is now moored at Inveraray Pier as a visitor attraction. The sole remaining Clyde-built puffer that dates from the era of the Para Handy stories, the “Basuto” (1902), is to be found in England, at the Boat Museum at Ellesmere Port. Following the enormous success of their 1949 film adaptation of Compton MacKenzie’s book “Whisky Galore”, Ealing Studios decided to make another Scottish-themed comedy. Alexander MacKendrick, the director of “Whisky Galore”, had his attention drawn to the Para Handy stories. These evidently struck a chord, because the resulting 1954 film “The Maggie” has as centrepiece an old puffer of that name, with a crew which bear many similarities to those of the “Vital Spark”. In fact, two Clyde puffers starred in the film, the “Inca” (1938) and her sister vessel, the “Boer” (1941), built by Hay’s of Kirkintilloch, a firm which functioned both as a boat-builder and operator. Much of the filming was done on the island of Islay. Both vessels were scrapped in 1965, but at least they live on in film. The 1981 British spy film “The Eye of the Needle”, starring Donald Sutherland and Kate Nelligan, briefly featured a puffer, the ex-VIC 72 (1944). The storyline recounts the adventures of a German spy, stranded on a remote Scottish island during World War Two. Many of the scenes were shot on the island of Mull. VIC 72 had an interesting career, being known as “Eldesa” and “Eilean Easdale” over the years. Four series of the Para Handy stories were made for television, all produced by the BBC. The first was screened in 1959, and starred Duncan Macrae as Para Handy. Two of the crew, Roddy McMillan and John Grieve, were to feature in two later series. The puffer which stood in for the “Vital Spark” was the “Saxon”. All trace of that first series was thought to have been lost, but a “Herald” article on March 6 1990 revealed that a film had recently come to light, called “Highland Voyage” (1963). The main cast had been brought together again on the “Saxon”. The footage was shot by Douglas Gray. This is thought to be the only footage in existence showing Duncan Macrae as Para Handy. A second BBC TV series was shown in 1965-66, starring Roddy McMillan in the role of Para Handy. Once more, the faithful “Saxon” was called into play as the puffer. Sadly, for all her efforts, her reward was to be scrapped the next year. Unfortunately, too, all but one of the programmes from that series have also been lost. The same leading cast of actors was brought together in 1974-75 for a new series, although for the most part, this was a re-make of programmes shown in the previous series, this time in colour, and some of the episodes have survived. Yet another TV series, “Tales of Para Handy”, was screened in 1994. Starring Gregor Fisher as Para Handy, Sean Scanlan played the first mate, Rikki Fulton appeared as McPhail, the engineer, and Andrew Fairlie played Sunny Jim. The series was set in the 1930s, and it is acknowledged as being more faithful to the original stories than its predecessors. 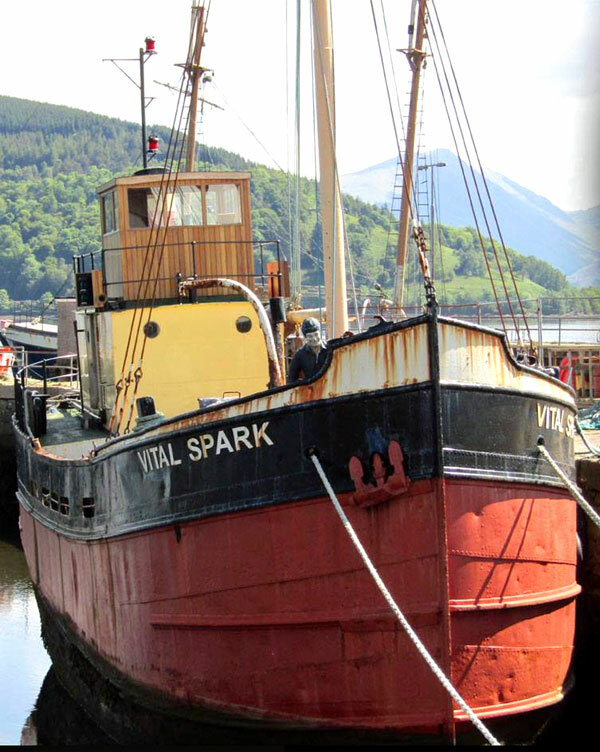 For this series, the “Vital Spark” was played by ex-VIC 27 (1943), often to be seen in the canal basin at Crinan. Over and above the world of Para Handy, footage of old puffers may be seen as part of various documentaries. “Clyde Puffer Memories” is available for purchase as a Video/DVD. There has also been a recent hour-long BBC TV documentary, which was presented by David Hayman, entitled “Scotland’s Vital Spark: the Clyde Puffer”. There are several excellent books about the Clyde puffer, and it is worth remembering that the Para Handy stories have never been out of print. Truly, the story of the puffer continues.